I need a warm, cozy, yet tough and heavy questing outfit for Forochel. I’ve been looking forward to this stunning, exotic zone forever it seems. Still pretty dang close to what Starry did, and not quite what I’m looking for yet. Even though it isn’t heavy armour at all, the knee-length robe looks bulky enough that it is easy to imagine her chain mail suit on underneath it, and the heavy, water-resistant and highly insulating wool of the robe would be the perfect thing for the harsh Forochel weather. 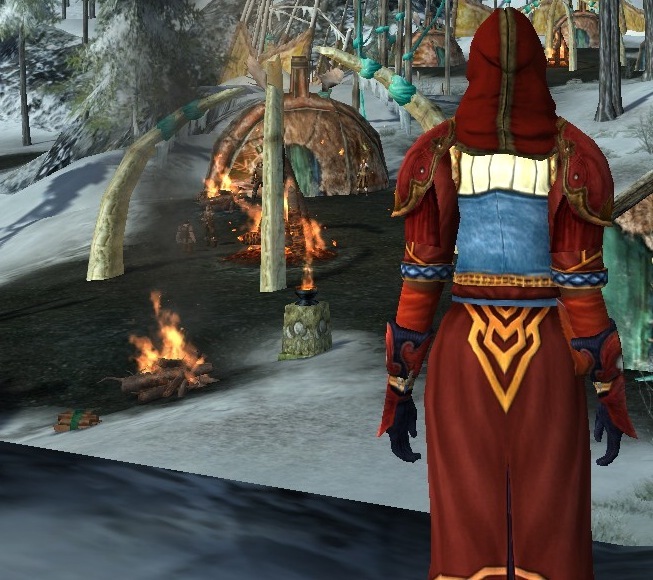 She would have gotten this robe from one of the traders bringing goods to the Lossoth from the south, the geometric patterns, primary colors and mountainous scene would delight the snow-dwelling people. The fine quality oiled-leather boots are also water resistant, and they would be thickly lined with wool, so that even when the persistent snow worked its way past the leather her feet would remain warm. When the temperature starts to plummet and icy fog rolls in from the bay, she wraps the Cloak of Winter Nights and its fox-fur warmth around her, its starry sky dyed the bright sea blue the Lossoth love so much. *Apparently only Tailors come to Forochel. Well no more! I shall make mine own pretty armour, dammit! Also, crazy that none of the other metalsmiths I know came here. There is ancient ore absolutely everywhere. I hit 46 and Friend to the Lossoth! Now I can make the Mammutti shoulders and gloves, wheee! Tried them out on my cold weather outfits and OF COURSE liked what I already have better. *shakes head in resignation*. Woot! 50 and Kindred. Good thing too, Moria looks cold.